Last week brought us the first round of reviews in the ultimate sock showdown, The Great Sock-Off 2011. Adam Dave and I put our Point6 socks to the test on the trail and then offered our opinions on their performance. 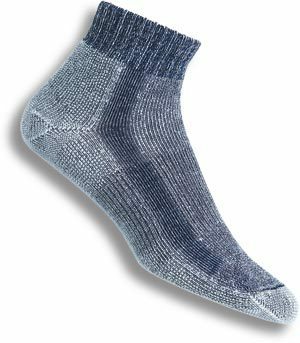 My Point6 sock review was rather surprising, especially considering that I was advocating synthetic fibers coming into this debate! Quite frankly Point6 did better, much better than I expected a wool sock to do! Now Adam, Dave and I will be hitting the trail again. This time wearing Thorlos synthetic fiber socks and putting them through their paces. Just as last week all three of us will put our socks to similar tests, evaluating their pros and cons, and then compare them to see which fiber reigns supreme! Will it be wool? Or will it be synthetic? Once again I’ll be hiking one of my favorite trails, the 8 mile Sag Valley Yellow Trail. A loop starting at the Swallow Cliff parking lot, the wide trail hugs the base of the bluff as it heads eastward, eventually circling southwest to McClaughry Springs and then to the top of the moraine above McClaughry woods. The trail then weaves down through the Laughing Squaw Sloughs and continues west across the Sag Valley, named for the former Saganashkee Swamp. Point6 put in a strong performance last week… Can Thorlo match it? Who knows? Follow hashtag #Sockoff2011 on twitter for more information! But don’t just take my word for it! Remember to read Adam’s Thorlos review at his blog HikingTheTrail.com, and Dave’s Thorlos review at his blog DaveCreech.com, and of course you know where to find mine right? So stay tuned for the results!